What does being “ashamed” look like? Does the gospel embarrass me? To dance around the truth with the idea that the truth is ultimately unknowable. The gospel calls us to make claims of truth — assertions that are undeniable. To state that “Jesus is THE way” is a truth claim. Though I fully believe it, sometimes my silence may lend agreement to something else. We can sometimes fear to assert and instead, shut down and say nothing. 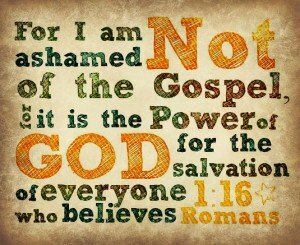 Perhaps you can think of other ways that being “ashamed of the gospel” comes into reality in your life. If so, feel free to share it with me. Can you think of a time where you were “ashamed of the gospel?” Feel free to share in the comments if you wish. Hi Chris… Good to see you posting again. Biggest time of shutting down and saying nothing is with family. They already know what I believe…ongoing sharing seems to “rock the boat”. Please pray as I go to my nephew’s wedding in PA over LD weekend that the Lord would give me both boldness and love. * not standing up for my faith when it would have been appropriate. * allowing myself to let conversational opportunities to slide by. They are all nuances on the same theme: remaining silent when perhaps I shouldn’t. But I keep learning, and growing in confidence that I can help other’s learn how to overcome such fears.